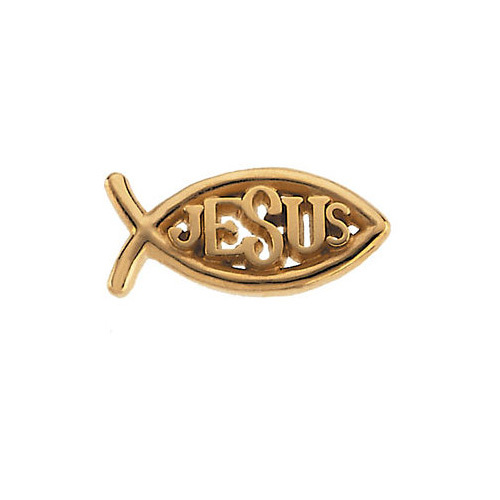 This solid gold 14K gold Jesus Ichthus lapel pin from Apples of Gold Jewelry is the perfect addition to your church attire or your everyday wardrobe. The beautiful pin is created in solid 14K yellow gold - not just gold plated. The pin, which features "Jesus" on the inside of a Ichthus fish, measures 9/16 inch long by 1/4 inch wide, and is also available in 11/16 inch long by 5/16 inch wide. This pin is a design that you will be sure to hold close to your heart. "Psalms 51:10 - Create in me a clean heart, O God; and renew a right spirit within me." We guarantee our 14K Gold Jesus Ichthus Lapel Pin to be high quality, authentic jewelry, as described above.